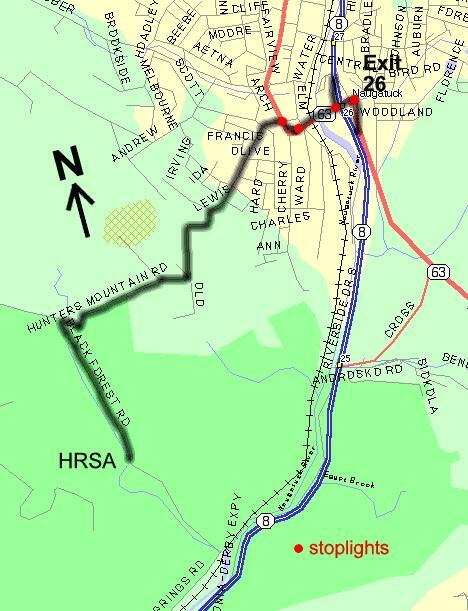 Take RT 8 North to RT 63 (Exit 26). Turn left at the end of the exit. Turn left at the third traffic light (Scott St). Turn left at the top of the hill on Lewis St. Lewis St. will turn into Hunters Mountain Rd. Follow Hunters Mountain Rd. to the entrance of Naugatuck State Park. Turn left into Naugatuck State Park. The High Rock shooting range is about 1.5 miles on the right.